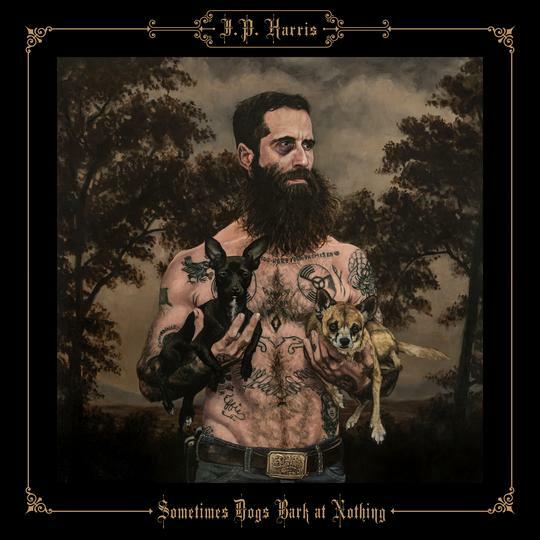 Free Dirt Records have been responsible for some exceedingly good album releases in recent times and this continues with the brand new record from JP Harris. When you are in the company of artists such as Western Centuries, Dori Freeman, Rachel Baiman and Vivian Leva, the bar is elevated high; a challenge richly accomplished throughout the short shrift tones of SOMETIMES DOGS BARK AT NOTHING. Regardless of the back-story, which may or may not be relevant to the listener, you gain the impression from the off that JP Harris is a straight-up no bullshitting honky tonker. The songs are brash, cutting and splashed with an element of rawness. Just glancing at the titles before spinning a single track, the vocabulary is awash with negative connotations such as nothing, quit, blues, dead and alone. However, this is country music and wallowing in some sort of depressive misery is a badge of honour, and we purists would not have it any other way. Of course the motto ‘sad songs = happy person’ increasingly gains traction to put things into some perspective. The opening bars of this ten track-thirty one minute offering immediately throw up one association – Sturgill Simpson in his pre-Meta Modern days. Throw in a couple of detectable Cash and Kristofferson moments and the shaping of a modern day country music outlaw takes shape. There is a touch of self-homage in the opening track titled ‘JP’s Florida Blues’, an instant fast paced driving rocking number that knocks the album into shape with no delay. It takes a few more tracks before this frenetic activity surfaces again. The track to do this is ‘Hard Road’, and the initial associated thoughts confirm. In addition, to leave you on familiar ground, JP frantically strums through the blistering ‘Jimmy’s Dead and Gone’, hailing the never to be forgotten train rhythm that has railroaded through country music since the days of Jimmie Rodgers and probably before that. For those of you who prefer your honky tonk of a slower persuasion, dripping with one voice drowning their acoustic guitar or piano with heaps of self-penned melancholy, then JP Harris is right on the mark. The ubiquitous curse of the alcohol habit gets the full treatment in this style courtesy of ‘When I Quit Drinking’ and ‘I Only Drink Alone’. Cliché or not, you get what you are dealt in these waters. The title track anchors the album at no. 5 in the running order and ‘Sometimes Dogs Bark at Nothing’ sees our protagonist get metaphorical in his song writing. An approach that is compelling for any song-writing junkies out there. Earlier in the album ‘Lady in the Spotlight’ opens with a tidy guitar riff before emerging into a song that draws the Kris Kristofferson comparison. At this stage, any attempts to anoint a crowning track vanish as this album deserves its entity platform and you cannot moan that half an hour of excellence is taking up too much of your time. Of the remaining tracks, ‘Runaway’ see JP joined by Kristina Murray on harmony vocals, an artist who has been attracting serious praise for her recently released record. ‘Long Ways Back’ has a late night blues feel to it and neatly fits into the moment when the record slides into some heartfelt melody. ‘Miss Jeanne-Marie’ gets the full character treatment and JP uses piano to ramp up the story- telling mode. Expect to hook in securely here, but as it is the penultimate track, you will already be on-board. JP Harris makes country music as was meant to be. Oh and there is plenty of essential pedal steel. SOMETIMES DOGS BARK AT NOTHING knows what it is about and powerfully presents a slice of music that retains a gilded status.